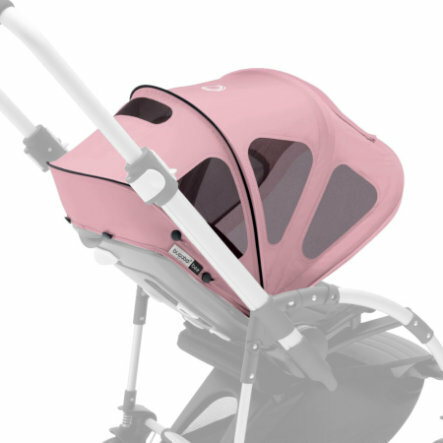 The multi-functional Bugaboo Breezy Sun Canopy provides head-to-toe sun protection and extra ventilation on hot sunny days. A zip-up window allows extra ventilation and easy access to your child. Position the canopy to ensure your child is protected throughout the day. Need extra shade? Our integrated pop-out sunshade has you covered. • Protects your child: the breezy sun canopy provides UPF 50+ and is water- repellent (excl. integrated mesh parts). • Extendable sun canopy: unzips to give extra coverage and ventilation. • Multifunctional sun canopy: offers head -to -toe sun coverage and mosquito protection. • Zip up window for easy access and ventilation. • Provides sun protection and shade.